McBarron Wood Accountancy & Financial Services consulted with MidniteHour to re-design their brand identity and redevelop their online recruitment website with an engaging web design to give them far more control over the site’s content and to implement a fully functional user friendly driven database website which would provide an online recruitment system for employers and candidates to register and apply for jobs online, therefore enhancing user experience. The overall look and feel of the site design is clean and fresh, focusing on hot jobs available through the scrolling hot jobs board offered by McBarron Wood throughout the site. The design was implemented with easy to use navigation incorporating their services along with Financial and Accounting Recruitment and has a large candidate resource database. The navigation throughout is based around streamlining visitors to the appropriate sector on the website where a job search and registration facility for both employers and candidates can be found. Candidates are able to upload a video cv, therefore giving potential employers or decision makers an insight into their personality, interests, goals, and characteristics which are all important in choosing the right candidate. It also allows the job seeker to showcase their 'transferable skills' which would not normally show up in a standard resume or CV. The website features email alerts to candidates when appropriate vacancies become available. Live assistance has been implemented to help the user with any immediate problems or queries that may arise during their visit to the website. Blogs are published out onto the social network to keep interested users up to date and current on job offerings. The Content Management System was built with the ability for McBarron Wood to update their latest job vacancies, from viewing and responding to online applications quickly and easily, which are then automatically published to the live website. This enables McBarron wood to keep the site looking fresh and interesting for the new and existing clients. 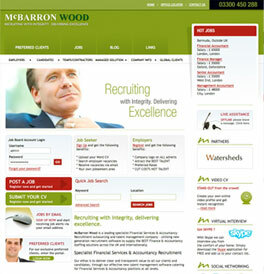 McBarron Wood is able to direct existing and potential new clients to the user friendly website to register their requirements whether it is to post a new position or to find a new job.